Say the words "classic epic" and only one name springs immediately to mind: David Lean. Arguably the most talented director in cinema history, the meticulous craftsman combined big narratives and broad spectacles with small, intimate moments and breathtaking images to create some of the most memorable motion pictures of the 20th century. Though Lean's four-decade tenure behind the camera yielded only 16 films – a lean (excuse the pun) canon for such a dedicated artist – all his productions are quality works that brim with style and impeccable taste, while actively engaging the senses, soul, and intellect. Every Lean movie merits attention, but he's best known for a trio of large-scale blockbusters that left an indelible imprint on the entertainment industry – 'The Bridge on the River Kwai,' 'Lawrence of Arabia,' and 'Doctor Zhivago.' And while the latter film may not quite equal – or hold up as well as – its two Best Picture/Best Director predecessors, it remains one of the most revered and beloved romantic sagas of all time, a picture as grand in scale, scope, and theme as any in history. Set against the shifting social and political landscape of Russia at the time of the Communist revolution, 'Doctor Zhivago' tells a very personal story of a passive man swept up and blown about by the winds of change. Yuri Zhivago (Omar Sharif) may be a respected physician, but he has a poet's heart, and his romantic nature tears that heart in two. On the one hand, he loves his loyal, dutiful, and doting wife, Tonya (Geraldine Chaplin), who tirelessly strives to fulfill him, and on the other, shares a deep spiritual and passionate connection with the beautiful, fiery Lara (Julie Christie), who must also fend off the aggressive manipulations of the rich, powerful Komarovsky (Rod Steiger) and manage a misguided marriage to Pasha (Tom Courtenay), a young revolutionary who surrenders his soul to Communist doctrine and becomes a hardened hard-liner. Unlike most heroes, Yuri takes little initiative; instead of driving his own life, he reacts to and deals with circumstances as best he can as they arise. Yet his inert behavior never engenders disrespect; on the contrary, it fosters an everyman attitude to which all of us can easily relate. Though we'd like to think differently, the majority of us probably would act just as Yuri does if we were in his shoes. Both author Boris Pasternak, whose novel earned him the Nobel Prize for Literature (which he was forced to refuse), and Lean have downplayed the story's political elements, terming 'Doctor Zhivago' more of a personal journey than a chronicle of social upheaval. But considering both the book and movie were created during the height of the Cold War, one can see why the Soviet government refused to publish Pasternak's magnum opus and why Lean's subtle digs at the burgeoning Communist regime resonated so strongly with American audiences at the time of the film's release, and still do today. Though rarely overt and clearly devoid of agenda, 'Doctor Zhivago' nevertheless depicts how the revolution irrevocably alters (and fairly ruins) the lives of the principals. Yet is it Communism per se that's the villain or simply man's out-of-control desire to control his own destiny? Such thematic topics are open for debate, but never eclipse the artistry that pervades almost every frame of 'Doctor Zhivago.' Yes, the narrative is strong (though portions of the second half tend to drag just a bit), but it's the manner in which Lean tells the story that raises the picture to a rarefied level. From top to bottom, from minute one to minute 200, the film grabs hold of us and continually makes us marvel at Lean's mastery of the medium. So many deft touches enhance not only the movie's emotional pull, but also our appreciation of the director's unimpeachable style. Here, he focuses heavily on shadows and reflections. Shooting through frosted windows and employing mirrors in myriad ways add a sense of mystery, and create strikingly composed, unforgettable images. Watching a canvas of snowflakes dissolve into a field of daffodils doesn't just transition one season to the next, but opens up a new chapter and a fresh mood in the film. And, of course, there are always Lean's signature shots of tiny figures set against expansive vistas, emphasizing man's inferiority to the unforgiving forces of his environment. Some directors' techniques often feels forced and self-conscious, but not Lean's. No matter how grand the spectacle or personal the exchange, the tone remains consistent and always natural. At times, 'Doctor Zhivago' feels like a symphony, and Lean is the virtuoso conductor. And it's almost as thrilling to watch him as it is to listen to the music he creates. The portrayals are all stellar, but in a film like this, acting is secondary; the story and director are the stars, and the performers are the supporting cast. 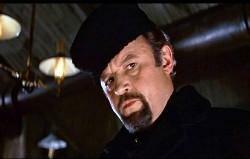 Even Steiger's scenery chewing – as entertaining as it is – can't steal the spotlight from Pasternak and Lean. Of course, few title roles give an actor less to work with than Zhivago (yes, I said less), yet Sharif is a riveting study in reaction, his liquid brown eyes absorbing blow after brutal blow and reflecting pain, joy, anger, confusion, and all too rarely, contentment. He and Christie create an understated yet smoldering rapport that imbues the film with the dull ache of unfulfilled desire. 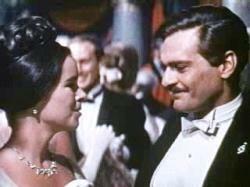 Though many term 'Doctor Zhivago' a Russian 'Gone With the Wind,' Yuri and Lara are no Scarlett and Rhett. There's no clever, suggestive banter, raging fights, or melodramatic couplings. If anything, Lean makes their romance a little too British (in other words, stiff), yet its understated power remains palpable. Christie is a vision of loveliness as Lara, and no doubt her fine work here combined with her excellent performance in John Schlesinger's 'Darling,' released the same year, resulted in her Best Actress Oscar win for the latter film. Chaplin makes a stunning debut, consistently winning our sympathy, and Courtenay nabbed a Best Supporting Actor nomination for his transformative role. And though his part is once again small as it was in 'Lawrence of Arabia,' Lean staple Alec Guinness can't help but command attention as Yuri's half-brother Yevgraf, who seeks to unlock the heritage of a young woman (Rita Tushingham) whom he believes to be the illegitimate daughter of Yuri and Lara. Nominated for 10 Academy Awards, including Best Picture and Director, 'Doctor Zhivago' won five Oscars – Adapted Screenplay, Cinematography, Art Direction, Music Score, and Costume Design – a testament to its brilliance across all avenues of production. And though today it may be better remembered for its instantly recognizable balalaika theme than its lyrical images and sweeping narrative, this Blu-ray edition brings the film's grandeur back to the forefront and honors a peerless director at the top of his game. Like the frigid Russian winters depicted on film, 'Doctor Zhivago' can at times seem a bit cold, but it's never distant, and it's that immediacy on a canvas as broad as the mother country herself that makes this epic an enduring and captivating classic. Diehard cinephiles have waited a long time for one of David Lean's classics to hit Blu-ray. (Although the director's final film, 1984's 'A Passage to India,' has already seen a high-def release, it doesn't possess the same cachet as his iconic works from the 1950s and '60s.) The sweeping landscapes, teeming crowd sequences, impeccably appointed interiors, and attractive actors make 'Doctor Zhivago' a Blu-ray natural, and Warner's excellent 1080p/VC-1 transfer squeezes every ounce of detail from each frame of this beautifully photographed film, which justly earned cinematographer Freddie Young an Oscar. While there are some fluctuations in texture and clarity throughout the 200-minute epic (how could there not be, especially when factoring in its advanced age? ), most notably inconsistent grain and intermittent softness, it's almost impossible to fault this meticulous effort, which marvelously reflects the movie's vitality and soulfulness. Any nicks, scratches, and dirt have been purged from the print, leaving a pristine image that's shaded by natural film grain, which helps recreate the original cinema experience. Well-defined lines and terrific contrast make the picture come alive, with both foreground and background elements exhibiting almost the same degree of clarity. Colors are bright and lush, but still appear natural, even the gaudy red dress that Lara wears to dinner with Komarovsky. In fact, reds – as they well should in a movie about the rise of Russian Communism – rule, adding forceful accents to many shots. Pastels, from the muted pink of Tonya's fur to purple and lavender upholstery, are also vividly rendered, and the yellows of daffodils and sunflowers perk up the drab interiors and barren, icy landscapes. Of course, there's a lot of white in 'Doctor Zhivago,' and though it resists blooming, the image's enhanced definition makes the snow and ice look oh-so-fake. Blacks, however, are inky and rich, and fleshtones remain stable and true throughout. Close-ups shine, and even if they don't possess as much dimensionality as one might like, they're almost always crystal clear and beautifully highlight Chaplin's striking features, Sharif's liquid eyes, and Christie's breathtaking beauty. At times, some solid backgrounds exhibit noticeable noise, but never with enough frequency to become annoying. Banding is absent, however, and any digital enhancements escape notice. While this transfer may not be perfect, Warner has done a superb job bringing this classic epic to Blu-ray, and even high-def snobs should be pleased with the result. The DTS-HD Master Audio 5.1 track does as much as it can with 45-year-old elements, and though you won't experience a whole lot of multi-channel activity as you watch the film, what you get is excellent quality sound with great dynamic range and solid fidelity. Any surface noise, pops, and other age-related defects have been meticulously erased, leaving us with clean silences and a robust music score that fills the room with warm tones and wonderful clarity. (The signature 'Lara's Theme' enjoys a marvelous purity that keeps it from becoming syrupy and trite.) For the most part, dialogue is easy to comprehend, although occasional phrases sound a bit muffled. Bass frequencies, however, possess plenty of punch, adding palpable rumbles to railroad sequences and some good weight to crowd scenes. Any movie buff worth his or her salt will tell you that no studio lavishes more attention on its classic catalogue than Warner, which produces stylish, substantive editions that truly celebrate some of the greatest films of all time. And while some consumers may have issues with Warner's mammoth box sets and some of the gimmicky "collectibles" contained therein, I can't imagine anyone taking the studio to task for its classy digibooks, which seem the perfect format for most classic films. 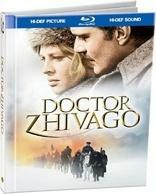 The 'Doctor Zhivago' digibook, of course, is no exception. Its hardback covers, enhanced by embossed lettering, encase the two video discs (a third disc – a CD Soundtrack Sampler that includes eight selections from Maurice Jarre's score – is affixed to the back of the digibook via adhesive and can be easily removed). Disc One, located inside the back cover, is a BD-50 that houses the feature and a few extras, while Disc Two, located inside the front cover, is a DVD devoted to additional supplements. In between lies a lavishly illustrated 48-page tribute to the timeless epic, featuring well-written essays on the film itself and its themes, all the major cast members, director David Lean, and author Boris Pasternak, as well as a trivia page and an assortment of gorgeous black-and-white and color stills. The presentation alone ramps up excitement and appreciation for Lean's work, and makes an attractive addition to any movie fan's collection. Hopefully, Warner will continue the digibook line for its future classic releases; there's really no better way to showcase these treasured films. Audio Commentary – A 200-minute commentary is the vocal equivalent of a runner's marathon, requiring a wealth of both mental and physical energy and stamina, so I'm more than willing to cut Omar Sharif, the late Rod Steiger, and Sandra Lean (wife of the late director) some slack regarding the gaps – a few of which are sizeable – sprinkled throughout the track. Sharif and Lean dominate the discussion, and recorded their portion together, while Steiger's comments were edited in later. All three, though, contribute engaging, insightful, and informative remarks, which make the time speed along at a surprisingly brisk clip. Sharif talks about how he was initially interested in a secondary role, never dreaming he would be asked to play the lead; he also divulges that Lean often felt creatively stymied by large-scale crowd and battle scenes, and expended tremendous effort in choreographing them. Lean's collaboration with screenwriter Robert Bolt and the troubles inherent in adapting 'Doctor Zhivago' for the screen are also examined, as well as Lean's initial displeasure with Maurice Jarre's score. Sandra Lean chronicles her late husband's early life (he was forbidden to go to the movies until the age of 14), and tells us 'Doctor Zhivago' opened to extremely poor box office until Lean re-edited the film a week or two after its release, at which point it became a huge popular success. Steiger is a hoot – humorous, jovial, blunt, and full of great anecdotes – and his defense of Komarovsky's character, though biased, is quite persuasive. Sure, this is a lengthy track to slog through, but it's never dull, and hearing the perspective of those actually involved in the film's production is a special treat indeed. Documentary: "'Doctor Zhivago': A Celebration" (HD, 40 minutes) – Divided into two parts, which mirror the film's two-act construction, this rather tepid film waxes poetic about this Oscar-winning classic, and features myriad industry professionals praising Lean's simplicity, analyzing various sequences and imagery, and celebrating the work of Sharif and Christie. Lean's attention to detail is also addressed, as well as the movie's color temperature. Some may find the testimonials and analyses interesting, but if you're at all familiar with Lean and 'Doctor Zhivago,' this comes off more like a primer than a master class. Disc Two is completely comprised of previously released material, which appeared on the 2004 DVD. Cast and Crew Listing – Filmograhpies for director David Lean and several of the film's key actors can be accessed with a click of the remote. A few of the listings also include a microphone icon, which, when clicked upon, plays audio quotes from such figures as Lean, Sharif, Christie, and Chaplin (who discusses the impact of her lineage on her casting), as well as an audio recap of the film's premiere. A nice way to dress up a dry feature. Documentary: "'Doctor Zhivago': The Making of a Russian Epic" (SD, 60 minutes) – Produced in 1995, this comprehensive and informative documentary outshines all the other extras on the disc. Omar Sharif narrates the hour-long film and recalls how grueling yet invisible makeup transformed him from an Arab to a Slav. Rod Steiger and Geraldine Chaplin share some colorful anecdotes, and we even hear from the real Lara, Olga Ivinskaya, whose affair with author Boris Pasternak substantially altered her existence. We also get a more complete picture of Pasternak's life, learn about director David Lean's perfectionism, and discover how the Spanish locations were selected. Composer Maurice Jarre describes the evolution of 'Lara's Theme,' and costume designer Phyllis Dalton remembers a tiff she had with Lean over the color of one of Chaplin's signature gowns. Well-paced and nicely packaged, this documentary is the definitive production chronicle of one of the all-time great romantic epics. Featurette: "Zhivago: Behind the Camera with David Lean" (SD, 10 minutes) – On-set and behind-the-scenes footage highlight this vintage featurette in which Lean himself discusses the casting of 'Doctor Zhivago' and we learn about the Spanish locations used in the film. Featurette: "David Lean's Film of 'Doctor Zhivago'" (SD, 7 minutes) – Another vintage piece, this featurette provides some background on author Boris Pasternak and relates the story of how the 'Doctor Zhivago' novel had to be smuggled out of Russia to be published. It also offers up an overview of the movie's locations, cast, story, and themes. Featurette: "Moscow in Madrid" (SD, 4 minutes) – The title is a bit of a misnomer, as this featurette recycles portions from other featurettes, and only focuses briefly on the picture's Spanish locations. It does, however, include some footage of workers building the massive Moscow sets. Featurette: "Pasternak" (SD, 9 minutes) – A more detailed look at the life of Boris Pasternak, this vintage featurette examines the author's early life (and how he was surrounded by such artistic dignitaries as Tolstoy and Rachmaninoff) and how the Russian government forced him to refuse the Nobel Prize for Literature. New York Press Interviews: Julie Christie (SD, 10 minutes) – This is fascinating stuff. While the trio of interviews (shot during a press junket) features the usual barrage of softball questions, it's not Christie's answers that entertain as much as her negative body language and thinly veiled disdain regarding the entire grueling process. Christie doesn't suffer fools gladly, and this parade of perky local journalists clearly sets her teeth on edge, despite her forced smiles and fake jocularity. It's a treat to see this natural, kind of feisty side of the actress. 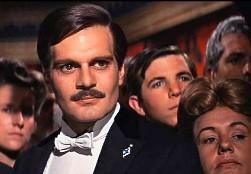 New York Press Interviews: Omar Sharif (SD, 19 minutes) – This absorbing collection of five interviews filmed at the same press junket displays a relaxed, affable, totally charming Sharif, who fields and answers the lightweight queries with grace and interest. The consummate professional, the actor rarely displays impatience or annoyance with the gushy reporters. Geraldine Chaplin Screen Test (SD, 3 minutes) – Two versions of the letter-reading scene, shot from different angles, provide a raw glimpse of Chaplin's innate warmth, which Lean would refine for the film. Featurette: "This Is Julie Christie" (SD, 1 minute) – A brief black-and-white promotional short celebrating the beauty and talent of the young actress. Featurette: "This Is Omar Sharif" (SD, 2 minutes) – Sharif rates a few seconds more screen time in this final promotional featurette that emphasizes the demands and seriousness of the film's title role. Featurette: "Chaplin in New York" (SD, 2 minutes) – Black-and-white footage from a magazine photo shoot dominates this reverential piece about the striking young actress and her debut on the world stage. Seeing the generally serious Chaplin display her lighter side recalls her famous father and the influence he surely had upon her. Theatrical Trailer (SD, 4 minutes) – This preview, released after the film had won five Academy Awards, concentrates on the scope and grandeur of Lean's production and the characters who populate it. Awards – A listing of the Oscars and Golden Globe Awards the film won. David Lean on Blu-ray is a gift that shouldn't be taken for granted, and 'Doctor Zhivago' is a film every serious cinema buff should consider adding to his or her collection. Epic moviemaking at its finest, this sprawling story of thwarted love, sacrifice, and spiritual triumph still impresses mightily 45 years after its initial release. Lean's keen eye, limitless vision, and masterful command keep us enthralled throughout most of this 200-minute motion picture, and the excellent performances bring Boris Pasternak's colorful characters to brilliant life. Though not a perfect film, 'Doctor Zhivago' depicts the period and how it influenced society with grit and style (even if it skimps on historical details), and its pluses far outweigh any emotional deficiencies. Warner's top-flight Blu-ray rendering proves once again why the studio is the leader in high-definition classics. Picture and sound are superior, outclassing any previous home video version, and, as always, a hefty supplemental package sates the appetite of even the most ravenous classics maven. Add in the sleek digibook packaging, and you've got a highly recommended release that will dress up any film library.